Earlier today Kyocera announced its latest Android-powered smartphone. But it’s a little different from its previous offerings. The Hydro XTRM (presumably pronounced “extreme”) is designed to handle all the rough and tumble you could possibly throw at it. 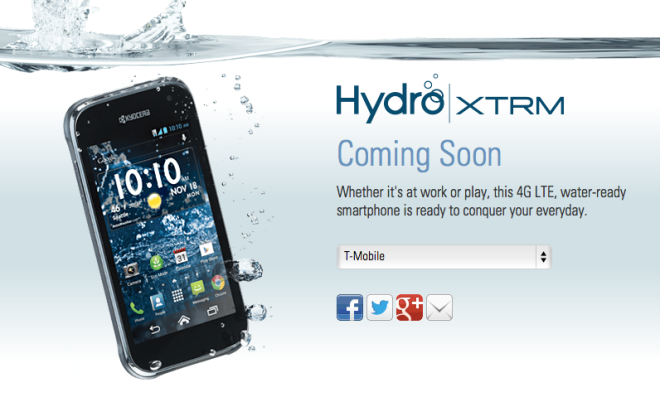 It’s waterproof, drop-proof and shock-proof. And it’s been designed specifically with businesses in mind. Particularly businesses where more durable hardware is preferable. All in all, it’s clear that specs weren’t the key focus here. It’s about making a capable and durable device, designed to be bought in bulk and handed out to a workforce who spend their days in industrial sites. It’s only going to be available through the B2B channels from November 2oth. To find out more, head on over to the splash page. Why don’t they make high end phones this tough? I would have gladly paid an extra 50 bucks if my Nexus 5 had these capabilities.. If you can’t break it, how do you expect them to sell you another one? Iphones…glass…u break, more money…multi million $ business, hello?! I dunno. Most people buy phones these days because they’re the new model and popular or the latest tech. I rarely see folks hang on till them until they break since the smartphone era. I’ve had my T-Mobile smartphone for 3 years, and nothing has happened to it until this morning when I dropped it off the back of my truck. The only thing that happened to it though was a small chip in the corner of the screen, nothing big. If you’ve been near where I live, we hold on to our smartphones like they’re our babies. I seriously doubt a high end phone with these added features would only add 50. If they incorporated it into the design from the beginning I don’t think it would be very costly.. I agree that 50 dollars extra would be all it would cost. the R and D already exist at samsung where they make the active. Thinner is nice but a lot of folks will take stronger. I think that this time where we drop are phones and the break and we charge them every single day will seem archaic in about five years. I don’t like to put cases, I think it takes away from the beauty of the phone.. I’ve had a cell phone for 10 years now, and I’ve never broken a screen, dropped it in the water, or lost it.. I’ve never needed to change my phone before 2 years are up, but I do because I want to upgrade. However, I would pay a little extra for the peace of mind, if it didn’t involve a case. Xperia Z1 comes out soon sounds like a good fit for then. It would be, if there wasn’t a $250 price difference between the Z1 and my Nexus 5.. I read a rumor about the galaxy s5 will be like the galaxy s4 active, but obviously with a better specs. because you are not in Japan, they get most of the time smartphones with this type of specs. some of the Arrows series by Fujitsu have a screen durable enough to bend withstanding different weight and their smartphones supports human centric engine which according to Fujitsu learns your phone usage pattern allowing you to maximize battery life, much like moto task but automated and better. Why only thru b2b for? Metro sell this phone. I been waiting for Tm to get this phone because where I work at,nice going Tm. I guess I just go buy it thru Metro. This doesnot makes any sense.Or I check out Obex cases too. I don’t see the white collar business person giving up their iPhone for this model phone. This must be geared towards blue collar workers. I’m not sure how well it will be welcomed when most of them use iPhones as well, and even get great cases for their phones. On another note, looks like an early iPhone…look out for Apple!! How about a Construction worker or a contractors crew roofers painters landscapers etc Not everyone wants to spend 650.00 to 850.00 for an iphone that does less then a cheaper android device. That’s who I was refering to as the blue collar worker, even the iPhone is in that market as well. I agree with you there, but I’m not sure they’ll make a dent in the B2B world with this device. I could be wrong, but we’ll just have to see. Not all B2B accounts are white-collar job accounts. We have business accounts with construction companies, contractors, factories, all sorts of accounts. I never said they were, I was saying that this device will likely not appeal to most of the B2B account when the iPhone is available instead. Or, as Tim S said above, “Sony Xperia Z. Waterproof, dust proof, shock proof. And better in every way I’m spec.” I realize that some B2B will be interested in this device, but there are other devices that are available and are FAR better in multiple ways. Just FYI the Xperia is NOT shock proof like the galaxy s4 active. Its just water and dust proof, but they will still break on normal drop. Sony Xperia Z. Waterproof, dust proof, shock proof. And better in every way I’m spec. Sony xperia z is water resistant, shock resistant, and dust proof. So if you read words carefully resistant and proof are two different words.